Why Need to Backup Oculus? By default, Oculus installs and saves all the games on C: drive, and only the new version of Oculus allows you to save Oculus installation to other drive. If you ever want to uninstall Oculus, the games and applications you installed will also be uninstalled along with it. As you may know, downloading games in Oculus is really slow if you do not use VPN to increase Oculus games download speed. Therefore, it is highly recommended to backup Oculus and the saved games before uninstalling. With more and more games saved to C drive, there is not enough space on it. In this case, you can take a backup of Oculus and then restore it to another drive. Also, you can directly move Oculus to another drive. 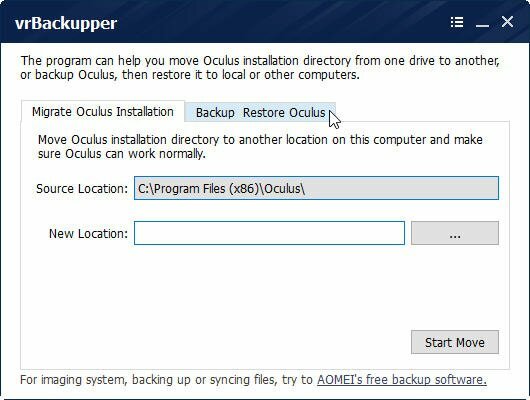 However, if you want to move Oculus to another computer, you need to backup it, and then restore it. Another reason is just for safety. Backing up enables you to keep a copies of your Oculus in case of your system crash or disk failure. 1. Close the Oculus application. 2. Locate and copy Software folder in the installation location of Oculus app, usually in C:\Program Files\Oculus\Software. 3. Locate and copy the Redistributables folder to another location on your computer. If your Oculus is not installed on C: drive, you should change the C: to the drive that Oculus is installed to. For saving the game data, you also need to backup this directory: C:\Users\<username>\AppData\LocalLow\Playful Corp\ProjectLucky\SCB\SaveData\. If you need a simpler way to backup Oculus app and games, you can use free third party software designed for Oculus backup and restore. How to Backup Oculus with Freeware? 1. Download, install and run vrBackupper. 2. 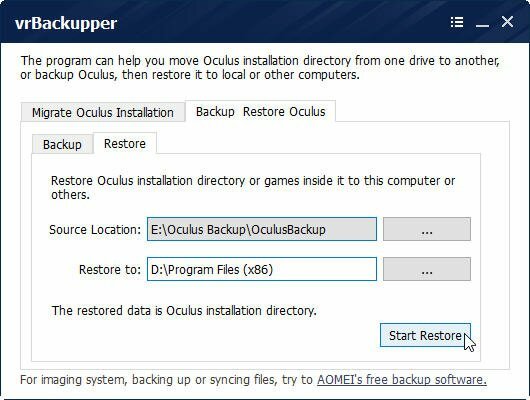 Click the "Backup Restore Oculus" tab. 3. Here you can choose "Backup Oculus installation directory" or "Only backup games and apps in Oculus installation directory". No matter which one you choose, the program will automatically detect the "Source Location". You just need to click the "…" button to select where to save the backup. When in a short while the backup will be complete. If you just copy these folders to another location as a backup, you need to copy the saved directory backup to the Oculus folder. If the one of the folder already exist, just override it. Keep in mind all these three folders have to be moved to the original location where it was copied in the first place. Then you can restart Oculus, and all the apps and games shall be also available. 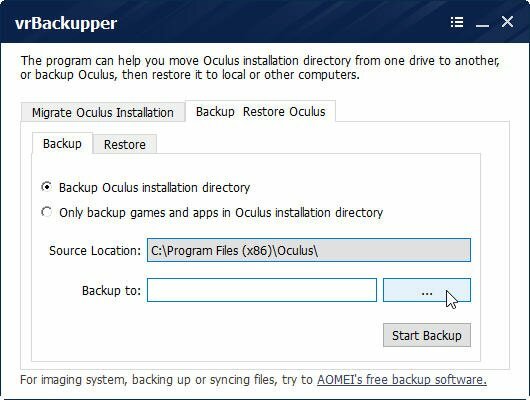 If you use the vrBackupper to backup, then the restore will be easier, because it also allows you to restore Oculus to another computer, which is also the default setting. You do not have to specify the destination location one by one and all these folders will be restore to the original location in one go. This software vrBackupper is quite convenient in order to backup & restore Oculus before uninstalling. Besides, it can also be used to move Oculus installation to another drive in order to free space on C: drive. Tip: vrBackupper only supports Windows 64 bit. If you want to move Oculus games in other systems, please upgrade to Oculus Game Mover.